Corian® is nonporous, its seamless finish means that it is easier to clean and keep hygienic in areas where high expectations of cleanliness are essential. 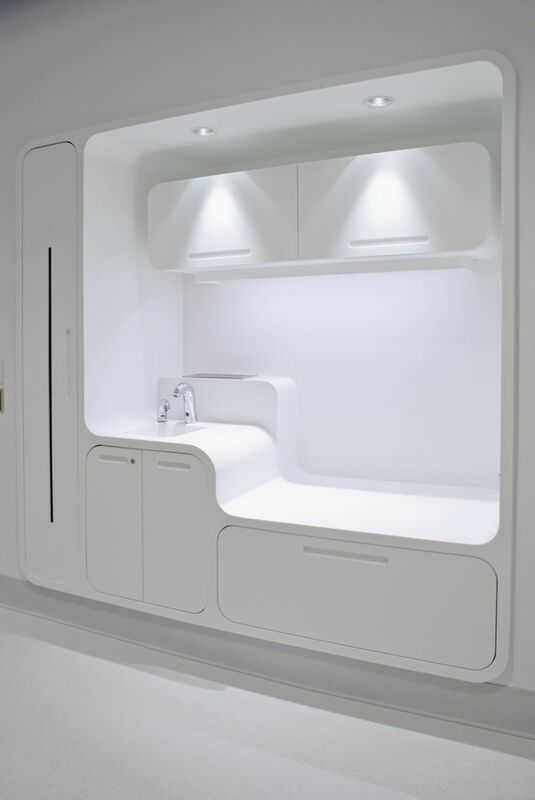 Corian in healthcare and other solid surface materials are perfect for the modern healthcare environment. When designing for today’s modern and demanding environments, surfaces need to not only look beautiful, but also need to perform. In spaces such as dental surgerys, hospitals and modern clinical environments, designers are able to combine style with low maintenance creating spaces that are easy to work in, easier to clean and are highly durable. All of which contributes to sustainable building design. Counter Production manufacture and install Corian and other solid surfaces in the healthcare sector and are perfectly placed to help you achieve you designs and project goals. Where can Corian be used? Patient Rooms, Operation Rooms, Testing Areas & Labs, Main Lobby, Nurses stations, Hand wash Stations and Public toilet areas. What are the advantages of Corian/solid surface? Flexible and versatile – it can be molded and textured to meet your design imagination. Nonporous and Stain Resistant – Spills don’t permeate the surface. With correct cleaning, promotion of mold, mildew or bacteria growth is removed. Durable – Heavy use and resilience in busy clinical environments means less down time. Restorable – Marks and scratches can be easily removed/repaired returning the surface back to its nonporous, stain resistant starting point. Easy to Keep Clean – Seamless integration with no dirt traps make cleaning quicker and more effective. Corian® is nonporous, its seamless finish means that it is easier to clean and keep hygienic in areas where high expectations of cleanliness are essential. Corian® is Greenguard Certified® as low VOC- emitting material and Greenguard listed for microbial resistance. It is also NSF/ANSI Standard 51 Certified for Food Contact. At Counter Production we have been involved in many Dental Surgery refits and bespoke laboratory projects. It is essential when using solid surface or Corian® that the fabrication and fitting are carried out by a Quality Network Fabricator to ensure that the material’s key benefits in a sterile environment are observed. We have heard of many instances where customers we told they we getting Corian, only to find out it was a cheaper alternative when something goes wrong – as one of DuPont’s longest Quality Network Fabricators, with over 30 years of experience, using Counter Production for your Healthcare project guarantees that this is achieved.